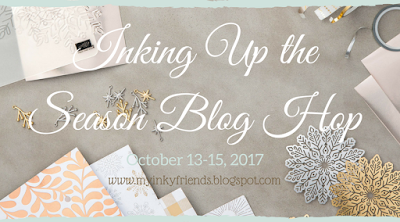 Welcome to the Lily Ink Pad stop on the Inking Up the Season Blog Hop. 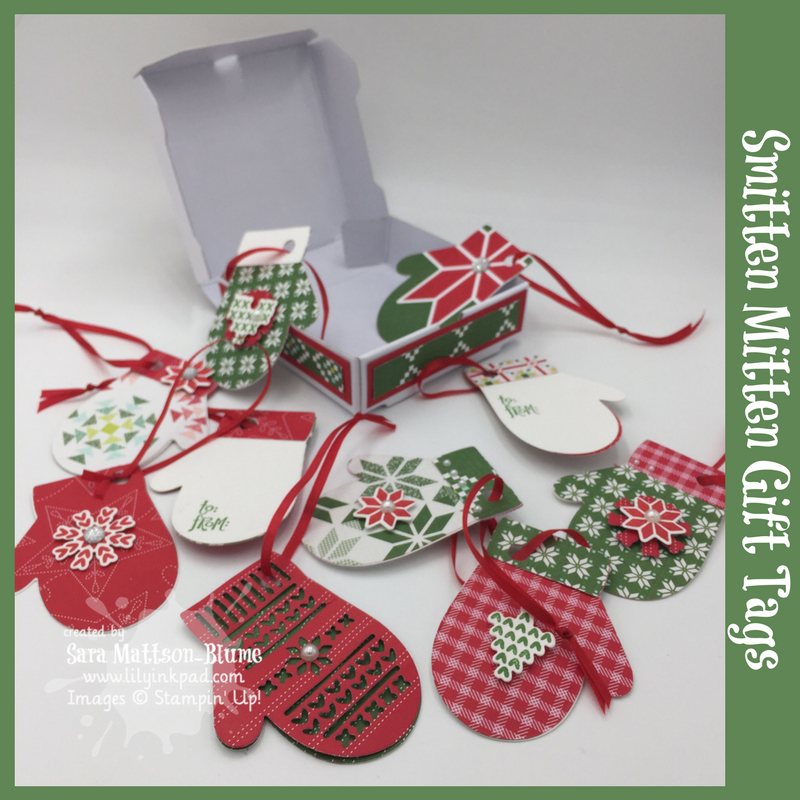 I am featuring Smitten Mitten, an adorable stamp set with matching Framelits. 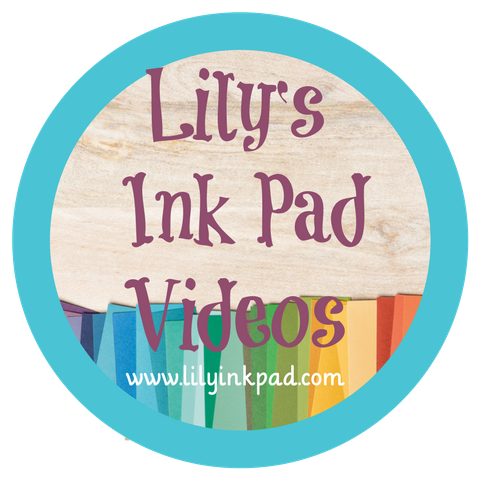 A blog hop is a series of blogs linked together. You may start here, then go forward to Betty's Blog featuring Season to Sparkle or you may have come from Tanya's Blog featuring Santa Paws. How cute is that set? My first project is a card that makes me smile--and think of being warm and cozy. Seriously, how cute! I used the detailed Mitten Die in Pool Party on top of a Crumb Cake Mitten base. There is only a left handed mitten with the cutout, but when you flip it, you can get both hands to look awesome. The Cable Knit Dynamic Textured Impressions Embossing Folder is Ah-mah-zing. I chose Very Vanilla because I always think of large, poofy Ivory sweaters popular in the late 80s. 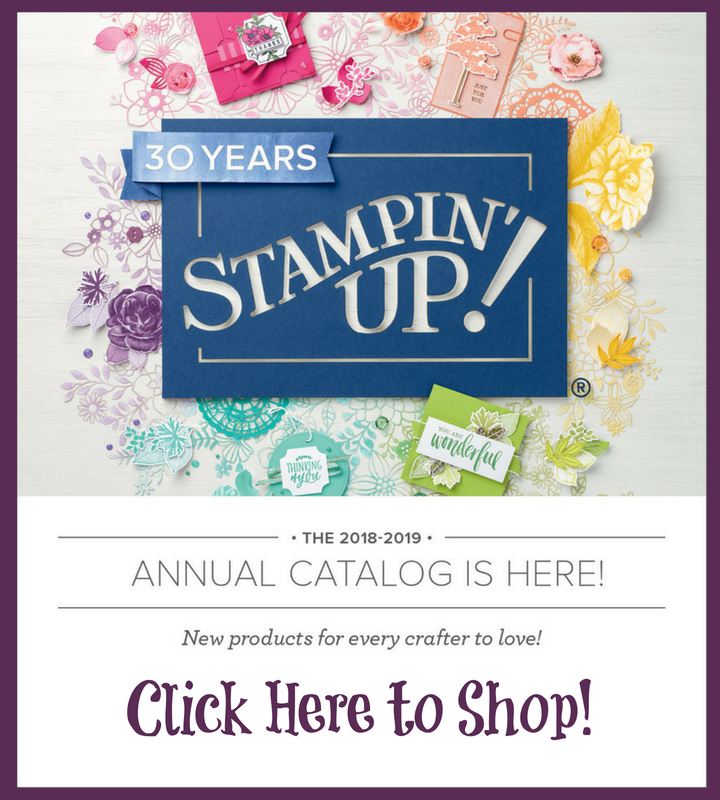 The sentiment on the front fits this stamp set and is from the Snowflake Sentiments Stamp Set. I stamped it on a Very Vanilla piece and punched it with the Pretty Label Punch. The Gold Metallic 3/8" Metallic Edge Ribbon is perfection. To add a little more elegance, I added a little strand of mini gold sequins. Inside, the sentiment is from the Smitten Mittens stamp set and I added some stitched hearts. My second project is a 2 for one. 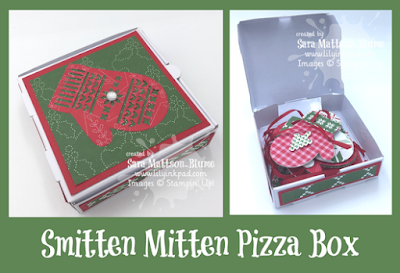 I transformed a pizza box into a gift box for a set of 10 gift tags! I combined the Smitten Mittens Stamp Set and Merry Mittens Framelits with the Quilted Christmas Designer Series Paper. I love the classic colors and patterns of this paper and how well they all work together to make such a cute set of tags! 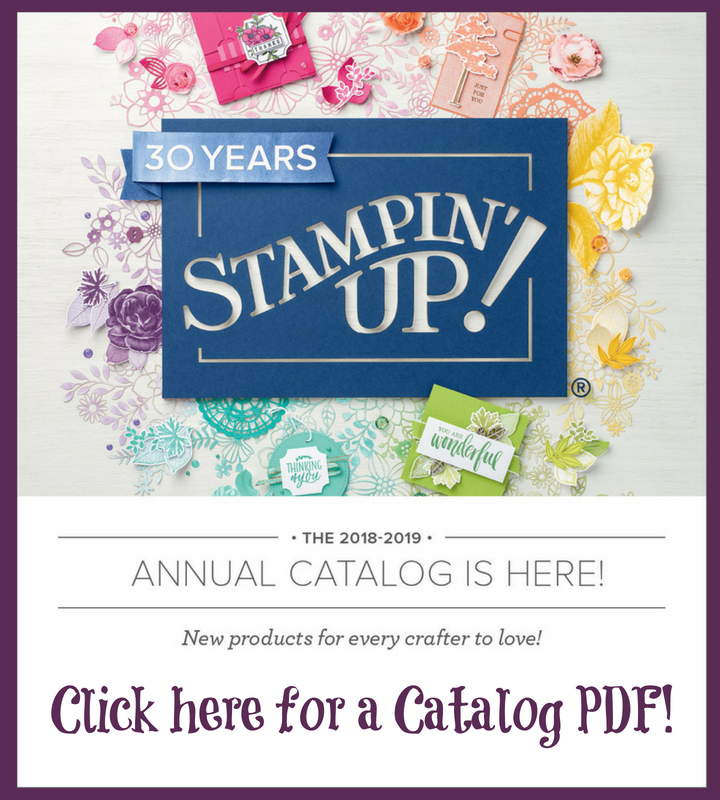 I had fun playing with the papers, stamps, and dies to create 10 different tags. I layered pieces, added pearls or Clear Faceted Gems. 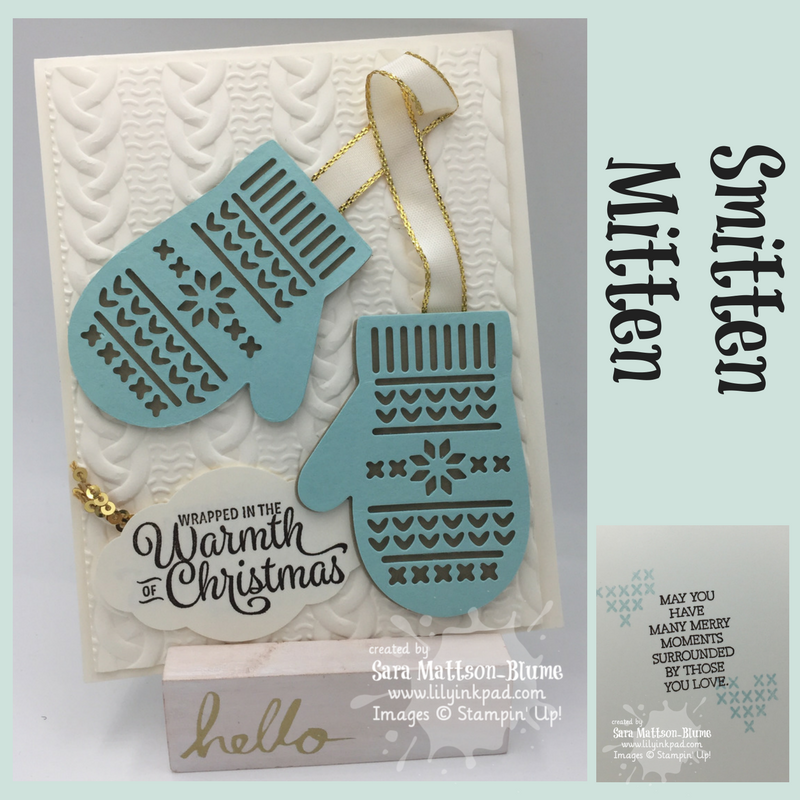 I adhered a white mitten on the back of each and stamped it with the TO/FROM stamp in the Smitten Mitten Stamp set. The final touch was a loop of Real Red 1/8" Solid ribbon that feels like taffeta. I can also see these tags hanging on a tree or making up a banner. How fun would that be? Thanks for checking out my projects! Now, you can hop on over to Betty's Season to Sparkle post or go backwards to Tanya's Santa Paws post. Either way, you'll come back here in a big loop! Fun! What great projects you created. I also think of those poofy sweaters whenever I see this folder in use! Great projects, Sara! I love your pizza box of mitten tags! Those projects are AMAZING, Sara!! The sweater texture with the mittens is genius. Cozy and cute! Your photo collages are super too! Sara, your projects are just adorable! I just love your pizza box with the super cute tags! I love your snuggly card, and your pizza box of mitten tags is amazing too! Super cute!! !